Nvidia's current Pascal GPUs are generating a lot of enthusiasm, but their successor, the Volta GPU architecture, is on its way next year, and there's a lot to be excited about. Nvidia unveiled Volta in a new Xavier supercomputer chip designed for self-driving cars, with the small surprising coming Wednesday at the company's GPU Technology Conference in Amsterdam. Xavier provides unprecedented computing horsepower, allowing cars to recognize images, analyze on-road situations, and take action. Much of the processing will happen on an integrated 512-core Volta GPU. Xavier will power the successor to Nvidia's current self-driving car computer called Drive PX 2. The upcoming chip hints at Volta's graphics capabilities. It has dual 8K HDR video recording capabilities, suggesting the new GPU architecture will explore areas beyond 4K graphics. 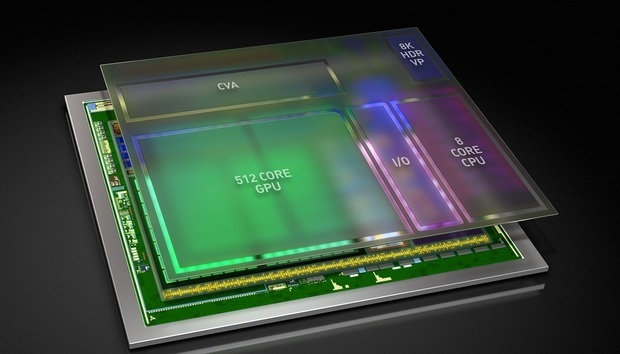 Nvidia in the past has said Volta will solve memory bandwidth problems and will be much smaller than predecessors. However, Nvidia hasn't revealed further details about the GPU architecture. Volta will also have a speedier NVLink 2.0 interconnect, and the GPU will be paired with IBM's upcoming Power9 chips in the U.S. Department of Energy's Summit supercomputer in 2018. IBM has said that each NVLink 2.0 lane will communicate at 25Gbps (bits per second), which would be seven to 10 times the speed of PCI-Express 3.0. Xavier also has a custom eight-core CPU and a new computer vision accelerator. It's the most advanced chip ever built by Nvidia, the company said in a blog post. Xavier delivers 20 TOPS (trillion operations per second) of computing power while consuming only 20 watts of power. It has seven billion transistors and is made using the 16-nm chip process. Those specs hint at Volta GPU showing big gains in performance and power efficiency. "A single Xavier AI processor will be able to replace today’s Drive PX 2 configured with dual mobile SoCs and dual discrete GPUs -- at a fraction of the power consumption," Nvidia said. The Drive PX 2, which was introduced at CES, has 12 CPU cores and two Pascal GPUs. It was the equivalent of having "150 MacBook Pros in your trunk," said Nvidia CEO Jen-Hsun Huang. Samples of the Xavier will ship in the fourth quarter next year to car makers, technology companies, research institutions, and other companies in the automotive industry. Volta-based GPUs could be released earlier than Xavier. Computers built with Xavier will allow self-driving cars to cruise the streets safely, Nvidia says. The company hopes Xavier will make cars smarter by recognizing what drivers encounter regularly -- signs, signals, lanes, objects, and pedestrians -- to avoid collisions and incidents with the traffic police. But Nvidia has recognized there are challenges to overcome. For example, self-driving cars may not be effective after a heavy snowfall, where lanes may not be clearly visible and driving conditions unsafe. Xavier could train a car to do a better job reacting to such situations. Safety is a big concern for self-driving cars, especially with recent accidents involving partly autonomous Tesla cars, which require humans at the wheel. But computers based on Xavier won't make safe driving decisions off the bat because they need to first be trained. The training happens with the computer absorbing images and locations and cross-referencing them with large repositories of images and data in the cloud. As the Xavier computer learns more, it'll increase awareness of surroundings and make smarter driving decisions. Nvidia has equipped the Xavier its new computer vision accelerator. The current Pascal chips already have machine learning instructions, and the GPUs combine parallel processing with algorithms to help cars safely navigate streets. Nvidia is doing well in the self-driving car market and is betting a big part of its future on it. Volvo is developing an autonomous car based on Drive PX 2. Nvidia is also working with companies like Audi and Ford on self-driving cars. The company competes with Intel in the space.